New England congregations call their buildings meetinghouses not churches, thus Old South Meeting House is named. Here Bostonians planned the Boston Tea Party. 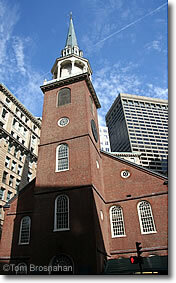 Built in 1729, Old South Meeting House was the largest building in colonial Boston at the time. Old South Meeting House, on Washington Street at the corner of Milk Street in Downtown Crossing (map), saw its most famous meeting on December 16, 1773, when a group of colonials in Indian dress set out from here to throw the Boston Tea Party. Though built originally to house a church congregation, today the building is a museum on the Freedom Trailwith exhibits of historical documents, currency, furniture, and a scale model of Boston in 1775, which gives you a very clear idea of the size and layout of the town. An audio-visual show recounts Old South's history. Some visitors confuse Old South Meeting House with Old North Church in Boston's North End, in the steeple of which two lanterns were hung to signal to Paul Revere that British troops were moving from Boston by sea toward Charlestown. Old South Meeting House is now surrounded by office buildings and the busy shopping of Downtown Crossing. Old South Meeting House, Boston MA.